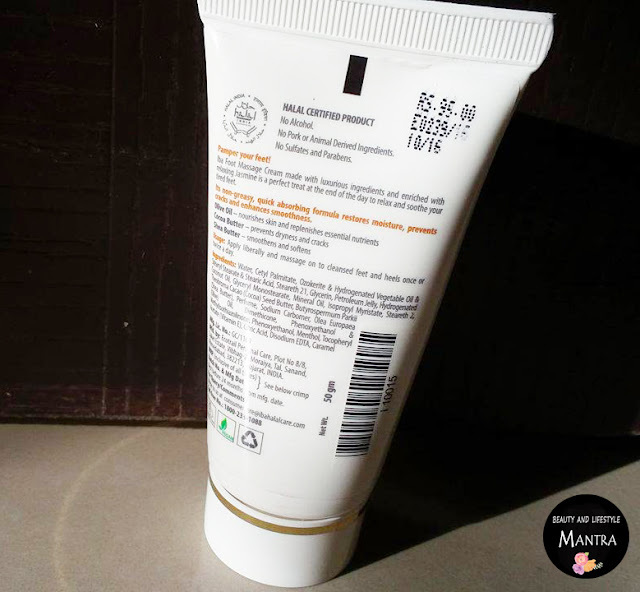 Today I am reviewing a Foot Massage Cream from Iba Halal. Iba Halal is India’s first halal certified and vegan cosmetics brand. They have also a very good range of hair and skincare products. All the products come at a very affordable price. Iba Halal Foot Massage Cream made with luxurious ingredients and enriched with relaxing Jasmine is a perfect treat at the end of the day to relax and soothe your tired feet. It's non-greasy, quick absorbing formula restores moisture, prevents cracks and enhances smoothness. Apply liberally and massage into cleansed feet and heels once or twice a day. Iba Halal Nourishing Foot Massage comes in a sizable squeeze tube with a narrow nozzle that controls even the tiniest amount of product well when dispensing. The tube is secured and has a white screw cap. 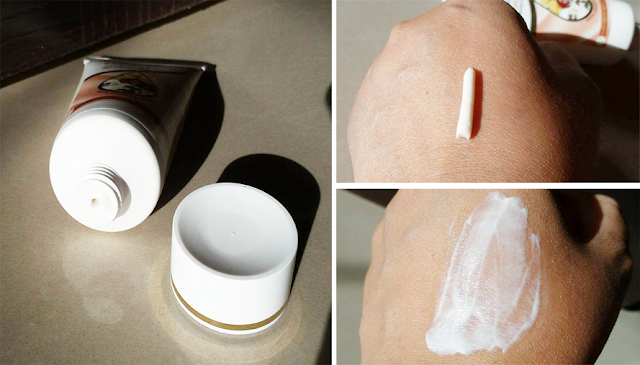 Due to the tiny size and tight cap, it can be easily carried in your handbag whenever you travel. The massage cream is white in color and has a strong fragrance of Jasmine. If you have a sensitive nose then it will definitely bother you. I just do not like the smell at all. Iba Halal Nourishing Foot Massage has a soft and a creamy texture. The consistency of the cream is bit thick but it absorbs quickly into the skin without leaving any sticky residue. Usually, I use this cream at night just after cleaning my feet with lukewarm water and soap. Since November I have using this cream for my feet. That time weather was chilled so I wear a pair of socks just after the application. But recently after use, I've not put on my socks for bed. It felt a little heavy on the skin during application. But this massage cream gives a very silky and smooth feeling. This cream does a great job because it's nourishing creamy formula absorbs quickly and hydrates my drier feet. It does not leave behind a greasy feeling at all. It makes my feet feel so smooth, soft and hydrated. It moisturizes skin well. Every morning I wake up with very soft and smooth feet. This is a perfect product for an everyday use on your feet. I think it's good for those who tend to have stinky feet. It helps with the smell while keeping your feet moisturized. Finally, want to add a point that Iba Halal Nourishing Foot Massage Cream is not a crack healing cream. So don’t buy it as a healing cream. It is a foot nourishing cream especially to those who love soft feet. Overall, Iba Halal Nourishing Foot is a good quality foot massage cream which is a great product for dry, dull looking, and super tired feet. This cream enriched with natural ingredients like jojoba oil, sesame seed oil, avocado oil, and grapeseed oil etc. It is free from parabens, SLS, and other harmful chemicals. It makes my feet feel velvety soft right after application. It feels me very comfortable, as it isn't sticky, greasy, or heavy. Definitely, you can see the visible difference within a week. I recommend giving this product a try. Nice review........ Another affordable and promising product.